Extended Stay Hotel Plano: We Are a Great Hotel for Travelling Salespeople! Are You a Traveling Salesperson? Get a Room at Studio 6! If you are a traveling salesperson, it can be difficult to find a place to stay where you can feel comfortable and that is centrally located enough for you to be able to make it to your sales calls easily. Trying to find a hotel that has all the amenities you need in order to have a productive trip can be difficult. Luckily, Studio 6 in East Plano is a perfect option! Each of our rooms has been remodeled recently, which means that you will experience the utmost comfort and style every time you walk in the door. Our comfortable furniture will make resting and relaxing after long days easy, and our centralized location makes it easy to get to your meetings! Contact us today to book a room for your next stay in the area. Plano is an amazing city for many reasons. We have several universities, a world-class medical center, and the feel of a small town. Best of all, it’s only 40 minutes away from downtown Dallas. Our location makes it easy for you to use Plano as your home base during a sales trip. Easily get around Plano and to and from Dallas/Fort Worth for all of your sales meetings without having to pay the incredibly high prices for a room in Dallas. Life on the road can be tough. If you stay in a new place very few days in a row, you can never really get comfortable. Luckily, at Studio 6, you can make yourself at home! We have large, comfortable rooms, free WiFi, a great fitness center, a business center, and we are close to many great restaurants. Best of all, because you are staying with us for more than just a couple days, you’ll save a lot of money! Our kitchenettes will help you save money by not having to eat out for every meal, and our comfortable suites make it easy to curl up with a book or watch something good on TV once your day is over instead of having to go to a movie or a club for entertainment. One of the best features of Studio 6 is that we let you bring your pets with you! Having your cat or dog with you means that you’ll be excited to get back to your room and spend time with them. If you have a dog, there are tons of great places to walk with them both in Plano and in the natural areas just outside of town. Getting exercise while you’re on a trip making sales is a great way to keep your energy high while you’re giving presentations and networking with potential clients. Make Studio 6 your home away from home! 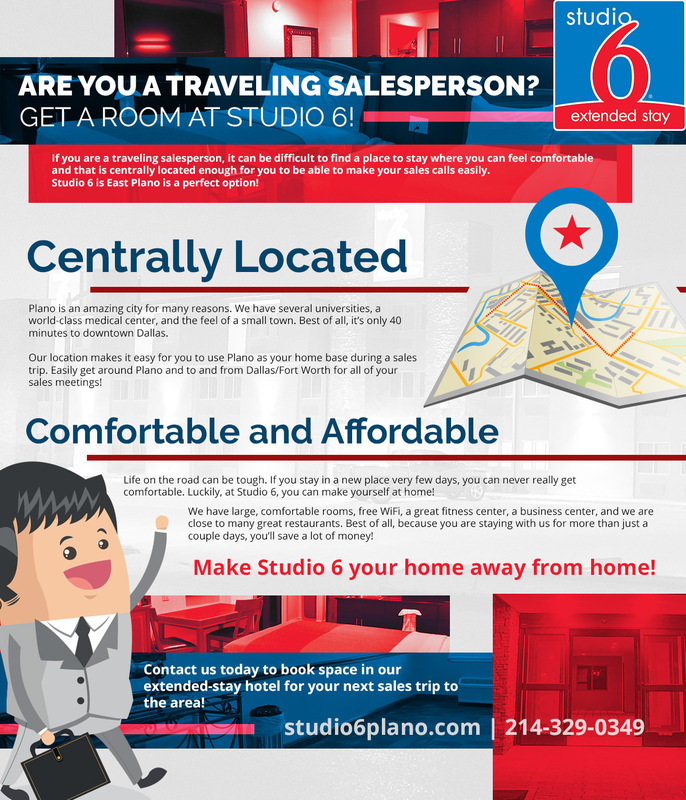 Contact us today to book space in our extended-stay hotel for your next sales trip to the Plano and Dallas/Fort Worth area! You’ll be extra comfortable and extra happy that you stayed at our extended stay hotel when you wake up refreshed and ready to meet your sales goals ever morning!